As the demand for LNG increases worldwide, players in the LNG market face seemingly conflicting challenges. On one hand, they must expand capacity in different regions, make the business and production as agile and adaptive as possible, and improve operation efficiency. On the other hand, they need to improve operating margins while upholding contractual obligations. To meet these challenges head on, advanced automation and IT solutions are required to enable operators and engineers to effectively oversee the business and plants while maintaining the quality and safety of operation. One of the key challenges in the LNG sector is presented by the number of players involved and their roles in a typical project. These will typically include end-users, stakeholders, EPCs (engineering/procurement contractors) in design/ engineering and construction sectors, industrial automation vendors, and supplementary suppliers and subcontractors. This diversity of participants raises the possibility of a number of potential problem areas along with related risks and opportunities. These include technical aspects such as the design of the control system to provide the optimum level of dynamic operation, and the selection of the appropriate equipment to guarantee proper operation and controllability. More significantly, however, it raises questions in areas such as the training of non-experienced operators, and operational IT support of those processes where business and production processes come together. One of the big problem areas is the lack of knowledge and experience among the players active in the development of a terminal. This lack of knowledge of the overall development, commissioning and operational processes can occur among end-users, EPCs and automation vendors, and is further complicated by the different ways in which LNG terminals are managed and operated. For example, the situation is different where the EPC is also a licence holder, or where the EPC has built up specialised knowledge or has an affiliated company with the required knowledge. Another challenge is provided by the development of 'merchant' type terminals by companies that make the infrastructure available or of 'dedicated' type terminals by companies with little experience in the midstream sector or in areas with low availability of suitable staff. These companies are relative newcomers to the market and do not necessarily have previous experience in this kind of project, and therefore have to rely on the availability of knowledgeable staff—typically on a freelance or temporary basis. Traditionally, industrial automation vendors have not been involved in this area, and have relied on the input by end-users, EPCs or licence holders for guidance on the overall design. What many of these organisations have in common is the need to maximise their return on investment, which in turn leads to a risk-averse culture that manifests itself in a mistrust of aspects that they do not fully understand—particularly anything that involves IT. This can lead to potentially serious problems, as the IT infrastructure of big projects is impossible to separate from the automation element. Moreover, there is now EU legislation in place that lays down specific rules about IT infrastructure and its interoperability. As well as these organisational challenges, there are also a number of new developments—internal and external—in the requirements for the operation of LNG terminals. Assuming ever-increasing importance is the regulation of infrastructure —based on EU directives—and associated health and safety requirements, such as emission monitoring. The LNG industry itself also poses new problems with the use of more sizes and types of carriers, more types or compositions of LNG, and new operational requirements, such as the option to load LNG and the need for more information such as reconciled mass balances. building a successful control system. What, then, are the ways in which these challenges are to be addressed, and solutions found to develop the opportunities involved with successful implementations? First there must be an acknowledgment—particularly by the end-users and stakeholders—that these problem areas exist. But this process also involves the EPCs, which must also understand the whole nature of the development process, and the automation vendors, which need awareness of the business processes involved. The key to successful project implementation is to acknowledge that this is not simply a technical or engineering exercise, but also involves complex human, management and economic interactions. This emphasises the need for cooperation between the automation vendor, the EPC and the end-user, with procedures put in place to overcome the potential problems. One approach that has proved successful, particularly in the context of the LNG sector, is for the automation vendor—provided that it has the necessary multi-disciplinary knowledge and experience—to assume the role of main automation contractor (MAC). In this situation, they will play a key role in design and implementation planning, and will be involved in the parallel development of solutions within and outside the contractual relationship with the EPC. Fortunately, there are enlightened end-users who have embraced this approach and involve the automation vendors at an early stage, even going so far as to preselect their automation vendors to work with other interested parties from the start. This approach is also permeating to other levels, so that there are now EPCs that are acquiring specialised knowledge of the requirements of the LNG industry. Ideally all customers should have this understanding, so that the automation vendor can always talk to senior management from the end-user. The implications for the automation vendor are that successful project implementation is dependent on far more than simply building a successful control system. 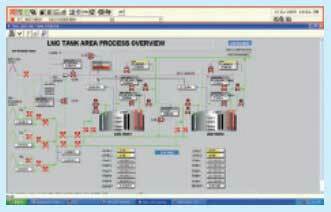 Automating an LNG terminal involves not only the hardware but a complete understanding of the process, which includes aspects such as operator training (aided by recent developments in plant simulation) and the integration of the automation infrastructure with the IT operations and business processes of the end-user. Even within the context of the traditional automation operations, aspects such as analytical instrumentation, CCTV, asset management and production control have to be integrated into the overall operation. With a global market share of 53%, Yokogawa is the market leader as far as its installed base of automation systems for LNG regasification plants is concerned. Besides offering technological expertise in LNG automation solutions, the company can offer engineering and project management expertise for large-scale industrial projects through its Yokogawa Europe Solutions BV in the Netherlands. Within this centre, a dedicated LNG team is responsible for the coordination and implementation of all LNG projects throughout Europe as well as some global LNG projects. Yokogawa Europe Solutions BV is working on Europe's most recent LNG terminals: the South Hook LNG terminal near Milford Haven, Wales, UK, and the Adriatic LNG Terminal on the north coast of the Adriatic Sea in Italy. 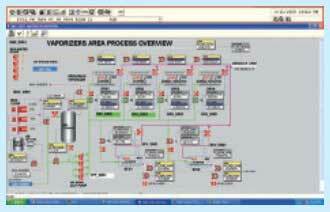 For both projects ExxonMobil selected Yokogawa as the MAC. Based on the excellent performance of Yokogawa on the South Hook project so far, Yokogawa Europe Solutions BV has also been appointed by CB&I and the BG Group as MAC vendor for the LNG regasification project in Quintero, Chile.